Obama doubles down on support of Clinton despite FBI review - Safer Reviews, Unbiased & Independent Reviews. Orlando, Florida (CNN) President Barack Obama doubled down Friday on his endorsement of Hillary Clinton, hours after the FBI announced it is reviewing newly discovered emails related to her personal server. Obama, while speaking to a crowd of mostly students at the University of Central Florida, did not mention the FBI probe but instead made the case for why he believes Clinton is the only choice for president. “She doesn’t just talk the talk she walks the walk. She’s got plans and she’s got details. And she’s read them through and she’s thought them through,” Obama told the crowd. Obama acknowledged that Clinton may not always be “flashy,” but told the mostly young audience that was she lacks in “sound bites” she makes up for with the work she does. “She knows what she’s talking about. And by the way, when things don’t go her way you don’t see her whining, you don’t see her complaining, you don’t see her saying things were rigged. She just comes back and she gets up and she works harder and she works harder until she gets done what she’s supposed to get done,” Obama told the crowd. This was Obama’s second time in about a week in the swing state. The President will return to the Sunshine State again next week in a final campaign blitz that has him campaigning also in North Carolina and Ohio. 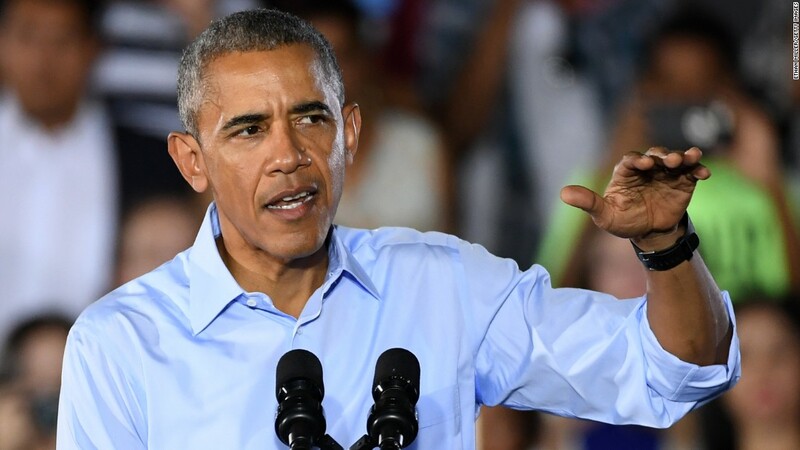 While in Florida, Obama also spoke about the highly contested Senate race between incumbent Sen. Marco Rubio and Democratic Rep. Patrick Murphy, whom Obama has endorsed.